Home >In 2019, These 7 Ecommerce Trends Will Add Values to Magento 2 Sites! Demands of consumers, especially online consumers, are ever-changing according to advances in technology. Hence, if you want to be successful in the e-commerce world, think several years ahead. And, talking about the future, we talk about TRENDS. In this article, let’s discuss 7 trends that will shape e-commerce activities in 2019 or even beyond. There are some familiar terms you have heard over the past several years, yet they are still hot. The others might be completely new. Whichever, you need to update yourself to stay in advance. More importantly, let’s see how Magento has improved its platform to catch up with these e-commerce trends and what to improve more. Safe to say that millennials and the young account for the majority of online shoppers who love purchasing via the internet and using smartphones than any others. Specifically, one survey by BigCommerce in 2018 revealed that millennials and Gen Xers spent 6 hours, nearly 50% as much time shopping online each week compared to four hours spent by their older counterparts. The traffic to e-commerce websites from mobile devices is also overtaking that from desktop or tablet thanks to its light content and convenience to access all the time and at all places. However, people mostly browse on mobile while finally purchasing on the desktop. The reason is that they feel more secure on the desktop and it is also easier to read the product or service in details. Such the fact demonstrates mobile commerce will soon dominate how customers access your website. Yet there is still a lot-lot to improve to make every experience on smartphones shoppable and convenient so that they need not purchase on the desktop anymore. One solution to optimizing mobile commerce experience is to offer mobile apps. However, it is very expensive to build and maintain one native app. Not to mention, online users hardly install any app except for those of their frequent and loyal brands. In that situation, the Progressive Web Application (PWA) has been developed and predicted to become a new normal – very soon! This technology will be the future of mobile web browsing in general and mobile commerce in particular. Support a new set of APIs: PWA studio makes important functions (e.g synchronizing and receiving data, predictively pre-loading content, sending push notifications) quicker and more progressive. Improve SEO juice: Keep in mind that Google considers user experience among the most critical criteria to rank your web, As PWA technology makes fast and reliable experiences, it will lengthen time on page, reduce bounce rate, then improve SEO value. Work on all devices: Here, we focus on discussing mobile experience, however, PWA is more than that. PWAs can and should be developed to be responsive on various screen sizes across mobile, tablet, and desktop. Hopefully, Magento team knows this trend. Thus, in April 2018, they announced Magento PWA Studio project to build ecommerce websites having app-like experiences. Great! However, PWAs are currently available in Magento Commerce 2.3 only. And, rather than a ready-to-use solution, it provides a set of tools for developers to bring these above ideas into reality. In other words, in 2019, there is a long way and open opportunities for the Magento team, Magento merchants, as well as Magento solution vendors, like BSSCommerce. Some of you might have heard of chatbots as the ecommerce trends in 2018. Why still I mention it for your goals in 2019? The fact is there are lots of potentials to unlock when its come to automation and chatbots, especially in customer service stage. Thinking about ecommerce automation trends in 2019, we should talk about chatbot. Every merchant needs to know that the common reason physical commerce still overweight ecommerce is that consumers feel shopping online lacks instant communications. Just imagine sending a message via an online website then waiting hours or even days to be replied. None will feel ease with such annoying and slow experience. That time, chatbot function plays the role of a smart alternative to human customer care experts to immediately interpret customers’ needs and respond to them as quickly as possible using advanced technology. So, what is chatbot and how it works? Have you used iPhone and asked Siri “What’s the weather like today?” – Then, you have already worked with a chatbot. Why is chatbot the ecommerce trends? “Messaging is one of the few things that people do more than social networking.” – Mark Zuckerberg. Hence, who will miss this means to turn online users into customers? Chatbot supports real-time conversations to optimize and speed up shopping process. A chatbot conversation is somewhat personalized, which increases the likelihood and value of sales. Chatbot will cut down on human cost and time for customer care by automation, for sure. However, there are various free and paid Chatbot extensions to bring this wonderful feature to your Magento 2 sites. Please note that the scope and complexity of chatbot depend on the algorithm of the creator. As can be seen from the example of Ray-ban, chatbot can support and navigate customers from searching, browsing to checking out the product. Hence, based on your business purposes, make a wise choice. People search by voice for ages. This is definitely not a new term. In 2019, if you still do not optimize your ecommerce site for searches by voice, your competitors will. Understand what your target customers search for: their pain points, their habits, their word choices, etc. Then, build FAQ page or build content relevant to questions. Answer questions clearly and concisely. Normally, when customers use voice search, they are on the move or in a hurry. Then, make the answer clear and straight to the point. Optimize long-tail keywords. Rather than typing pieces of separate keywords in the text box, voice search allows users to ask in more details. Thus, think about long questions when creating your content. Believe me, integrating long-tail keywords is not complicated work. If you put yourselves on your audiences’ shoes and write in a natural, conversational tone, there is a likelihood that you’ve already included them in your website’s content. Get updated on voice SEO. Voice search and text search has many differences. Hence, to bring your website up for search by voice, get your attention to the following SEO factors: well-structured content and data, featured snippets, local SEO, load speed. Does Magento help me to improve voice search? For the time being, you can not add voice search to your Magento 2 websites by default. This task, however, can be done by Magento 2 extensions. Right after completing this article, you can go for Google or Siri, asking “Hey Google/Siri, show me free and paid Magento 2 Voice Search extensions?” Check the result, you might find one that fit your needs. About voice SEO tips as above, you must invest some time to think about your content strategy in 2019, add it values of voice search. Bonus: An interesting post about voice SEO strategies for your thought, later. Still being impressed by how chatbot can add a personal touch to both buying and selling experiences? Then, Virtual Reality and Augmented Reality will be much to your surprise when being placed into ecommerce business to bring product visualization to a new level. Explosive as the internet and ecommerce become in the 21st century, consumers still love shopping at stores. Factors like the direct visualization, smells, sounds, and physical human interaction might be unique at a brick-and-mortar only. Hence, online merchants try to make their products as visual as possible using gif, video introduction, live stream, etc. These things seem still effective – I totally agree. Yet, if you find a better way to make product visualization better than any of your competitors, you will win and stay ahead, far ahead. 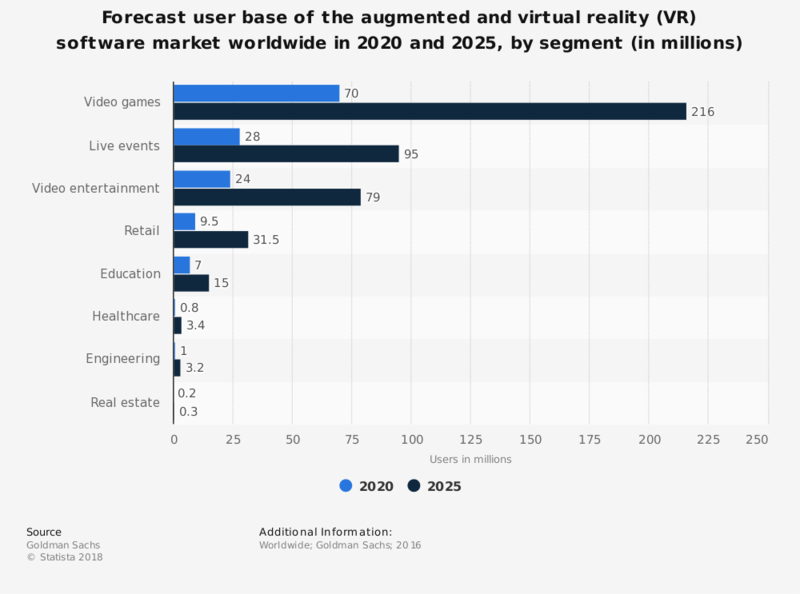 VR technology helps create a realistic three-dimensional (3D) environment with a mixture of hardware (e.g VR headset or controllers) and software, in which consumers feel interactive and physical-like. When they turn head, the virtual world turns with them. Mentioning VR, most of you think about video games or blockbuster movies. Yes, they are the popular uses of VR, now and in the future. However, people predict the role of VR in the ecommerce segment will become more and more significant. It makes products in the “virtual” places more “real” and “purchasing-persuasive.” – An art of marketing process. You run a natural cosmetic store that offers VR experience. Online shoppers put on their VR headset and shop around your website right from their home, and even in their pajamas. That means they can get the product off the shelf and view it in 360 degrees. Even more, you can tell the story behind how you source and manufacture that product. First, take shoppers deep down the sea to get fresh seaweed. Then, showcase the local beekeeper house where you buy honey for your facemask. Next, welcome shoppers to the laboratory in which you mix natural ingredients into perfect cosmetics. This is how you add value to your products and persuade customers to buy and become your advocates. Many of you might confuse VR and AR, are they the same? Augmented Reality fits well with your ecommerce business since it provides a way-fun experience for shoppers to “TRY BEFORE YOU BUY.” You can learn from what IKEA do or more. For instance, in your lipstick product page, spend a room for AR experience by replacing “add to cart” button with a “try”. When customers choose to try a product, they can put the color on themselves or use a default model. That time, AR function is somewhat similar to Snapchat’s filters. Does Magento support VR and AR? You love the idea of VR and AR to leverage customer experience and grow your sales. Then, you wonder whether to invest VR or AR in your Magento 2 website. Obviously, the default does not have any function like VR or AR. There is also hardly Magento VR/AR extension. However, thanks Magento team that this open source platform is freely customizable. So, if you have a budget and a plan to develop your Magento 2 website, think about VR/AR from now. As can be seen from above, product visualization is important in ecommerce segment. Employing VR or AR technology is a great idea, yet it takes time and money. Before you are ready for such big things, start with a simple method – Video Content. If a product image costs a thousand words, a video costs a million ones. Here the one I like. It brings me humorous feeling of the brand, get the presence of its niche product line. Does Magento support Video Content? If you have wonderful videos and want to show them off right on product pages, then hopefully, Magento does allow uploading in several easy steps. Please note that those videos will be integrated into your website via Youtube API. Thus, before you start, it is important to ensure that you have permission or copyright to upload any content. In other words, I recommend uploading your own content only. Besides, there are dozens of Magento Video Optimization extensions out there to enrich your content from various sources and make video display even better fascinating. In 2019, investments to leverage your content, especially video content will be profitable. Since years ago when ecommerce appeared and developed at an astounding pace, many people have thought of “ retail apocalypse” in which all shopping would eventually go online while physical stores would be doomed in time soon. With the increasing trend of ROPO, even Amazon – the giant online retailer shows itself offline. Have you heard of Amazon Go? Said like Amazon, this is an incredibly interesting way to shop offline. “No line, no checkout – Just grab and GO!” Building fame from its online website, Amazon drives customers to its physical stores. Now, there are only 9 Amazon outlets in the U.S that sell ready-to-eat food. However, this idea is promising to expand in both scale and product ranges. Soon, very soon. In 2019, if you fail to show your physical store presence, there is a likelihood that you will lose sales to your competitors. You invest to make awesome product content that earns shoppers’ love at very first sight, yet they head off for the rival’s physical stores instead. Speechless! But no need to rush since there is a lot to prepare before opening a physical store. Just something for your mind and for your successful plan. Continue strengthening your online stores to access a large pool of potential customers. Target to omnichannel strategy (*) to streamline customers experience and direct them to your physical store. Do market research and choose the best location to start your physical store. … Lots else to do. (*) About omnichannel strategy, we will discuss further in the next post. Believe me, it will be way-way interesting. Does Magento support managing both physical and ecommerce website? Those using Magento Community versions might feel lacked that Magento team only support these for Commerce version only. Do not worry since not all, but many omnichannel-features have already equipped in the Community. Moreover, hundreds of extensions are available on the market for any of your business purposes. For years ago, ecommerce seemed the playground of B2C businesses, in which most of website functions and designs were developed with individual customers in mind. Recently, that picture changes significantly! Though the number of B2C online retailers still shadows that of B2B, Forbes has predicted B2B eCommerce Market Worth $6.7 Trillion by 2020 – A bright future to invest. More and more B2B vendors join ecommerce game, making the market double profitable, yet triple competitive. If you want to expand your target customers towards B2B, it is your time. However, remember that B2B buyers now also search for a fast, direct, streamlined experiences with no resistance of meeting salespeople in person. Price transparency: There’s gone the time you hide completely your price and make it hard like hell to get pricing list. Again for your mind, B2B ecommerce buyers now like fast experience. They do not want to browse page by page, finding price nowhere, then having to write long emails or call you times to times. You can hide price for some, like non-logged-in customers but let them know how to get the exact – easily. Build rich content: B2B ecommerce websites usually focus on the order process and checkout process, making it fast, secure, and convenient. Meanwhile, content on the product page is somewhat poor and boring since salespeople will take care of product presentation. However, B2B now wants less interaction with salespeople. Enriching content such as product images, descriptions, videos, testimonials, etc. is a must. Personalized experience: Personalization is to present information to a customer, showing that you really know and understand his/her needs. That way, the shopping experience becomes more meaningful and delighting. In the B2B segment, personalization is far more important to build a solid relationship and increase sales value. Some personalizing tactics you must put into account now are custom catalog and pricing, quick order form, company account, requisition order, etc. How does Magento support B2B ecommerce? Above is Top 7 e-Commerce Trends by BSS Commerce. What is your top 7? Feel free to leave your comment below and I am happy to discuss more to rock off your next successful year.